A number of you asked about the NY Times story that reported on a George Mason University study that roughly a third of polled TV weathermen don't believe in man-caused global warming (http://www.nytimes.com/2010/03/30/science/earth/30warming.html). Specifically, 27% answered in the affirmative that "global warming was a scam." Only half thought that global warming was occurring. In contrast, nearly all Ph.D. and research meteorologists believe that global warming is occurring and will be highly significant. How can this be? I should note that this national poll is not representative of Seattle, where virtually all of our TV weathercaster contingent believe human-induced global warming is a serious issue. A key question you should ask is this: what is the scientific background of TV weather folk? Do they have the education or experience that would allow them to provide an informed opinion of this or other science matters? The truth is that most TV weather presenters or "weathercasters" don't have college degrees in atmospheric sciences or meteorology. My own rough estimate is that perhaps 1/4 have at least a B.S. in the subject. Very, very few have graduate degrees (M.S. or Ph.D.) in the field. The weekend weather folks generally have less real background than the weekday evening weathercasters, with the morning weathercasters a close second. 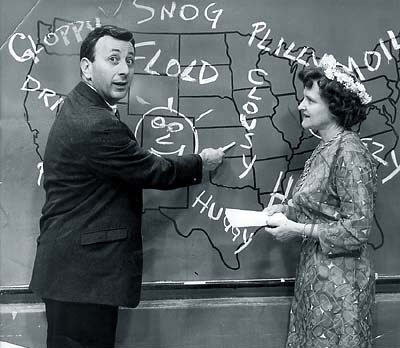 TV stations obscure this lack of education by calling their presenters "meteorologists" and sometimes using impressive titles like "lead meteorologist", "head meteorologist", or "senior meteorologist" without any basis in real knowledge. Let's be honest here, a B.S. in atmospheric sciences is the absolutely minimum background required for someone to have an informed view of the climate subject. A person with a B.S. degree has had calculus, physics, a good course in atmospheric physics, a class in atmospheric radiation, and quite probably one in climate. This is not even close to the education that someone in graduate schools gets and particularly someone working in the climate arena. So quite frankly, 75% of the TV folks don't have the knowledge base to provide a truly informed decision. The rest may be good communicators and fun to watch, but I wouldn't put much credence in what they say on topics outside their educational experience. I should note that here in Seattle our TV weather contingent is quite strong. Jeff Renner, Shannon O'Donnell, M.J. McDermott have B.S. degrees in atmospheric sciences from the UW and deep experience. Rich Marriott has a M.S. Steve Pool has co-worker Scott Sistek with a UW B.S. and I tutored Steve for several years in the subject. Rebecca Stevenson has been studying the subject through Mississippi State and sat in on my senior forecasting class. One of the arguments presented by the weathercaster doubters is that since we can't forecast skillfully more than approximately a week ahead, how can we predict climate a half-century from now? But the type of prediction is completely different: in one we are trying to predict the exact configuration of the atmosphere at a particular time, while in the other we are predicting climatological statistics average over extended periods of time. So global warming claims are like anything else: before you trust someone's opinion, better insure they have the background to make an informed judgment. Don't get me wrong, M.S. and Ph.D. types can make mistakes or overhype global warming issues, but at least they have the background to truly understand the details of the subject. This is not some elitist argument as suggested by a few of the comments below--this is a complicated business and it takes a substantial investment in time and knowledge to master the details.